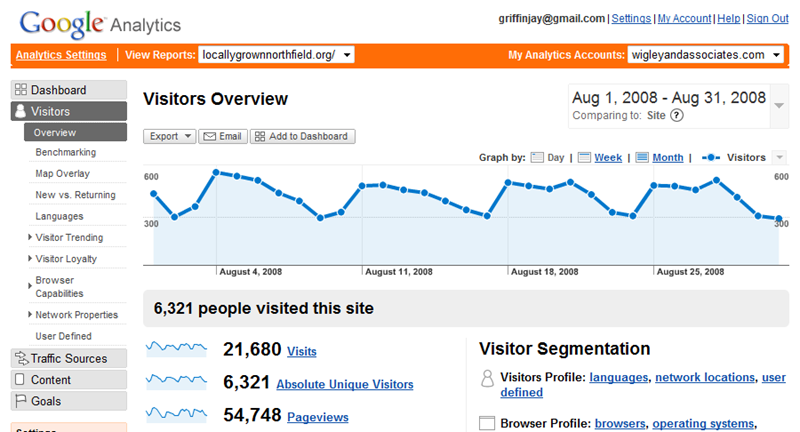 LoGroNo (Locally Grown Northfield) traffic for August was up 3-6% from July, according to Google Analytics. We had 75 different commenters during the month of August. We’ve been averaging approximately 800 comments per month (by 60-80 different people) since March, 2009. Our all-time record was 1900 comments in October of 2008. We’ve been averaging approximately 800 comments per month (by 60-80 different people) since March, 2009. Our all-time record was 1900 comments in October of 2008. 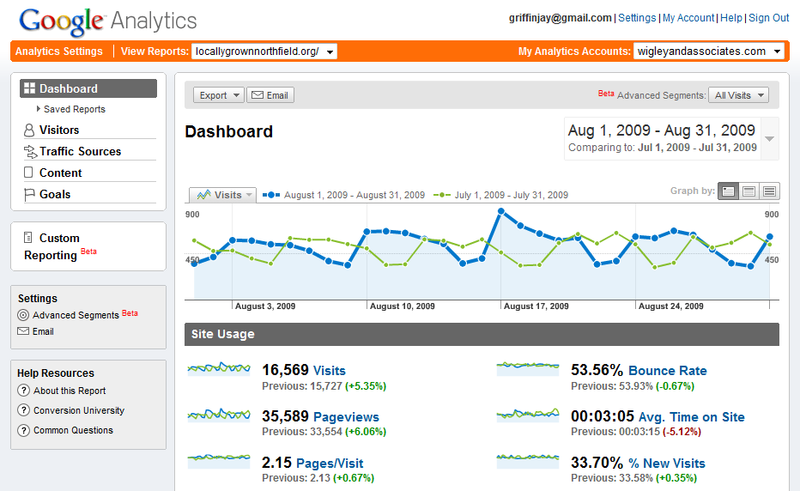 LoGroNo (Locally Grown Northfield) traffic for April was down 11-12% across the board, according to Google Analytics. The reason? I have no clue. Number of people commenting during the month: 84 (previous, 97). Number of comments posted during the month: 627 (previous, 607). 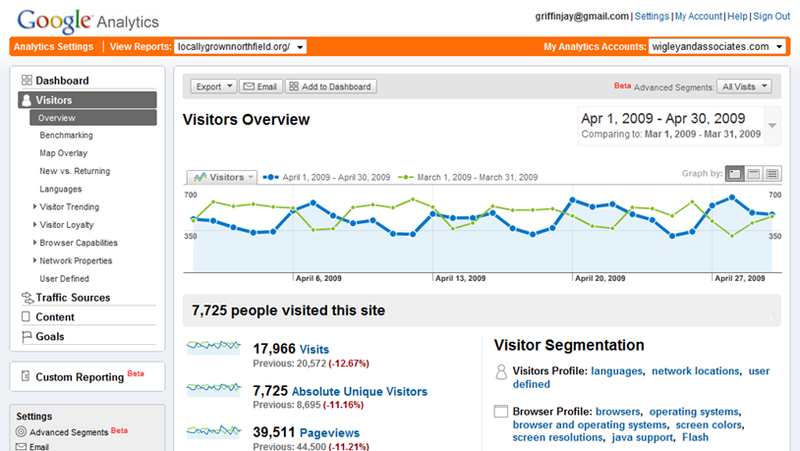 LoGroNo (Locally Grown Northfield) traffic for March was a mixed bag, according to Google Analytics. 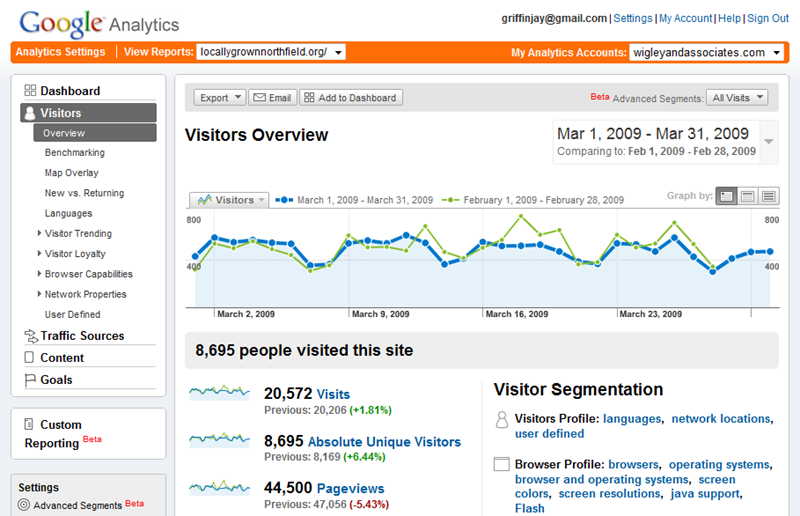 Site visitors set a record, with another 500 beyond last month’s record. Visits were up slightly; pageviews were down slightly; comments, and commenters were down significantly. Number of people commenting during the month: 97 (previous, 126). Number of comments posted during the month: 607 (previous, 878). 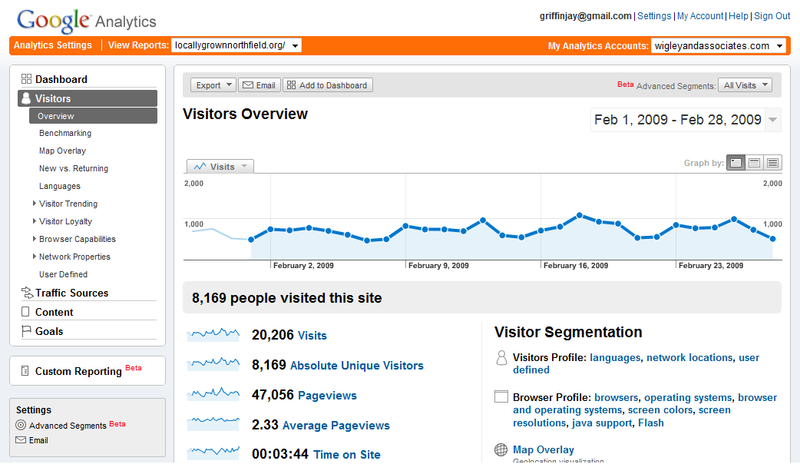 LoGroNo (Locally Grown Northfield) traffic for February was a mixed bag, according to Google Analytics. 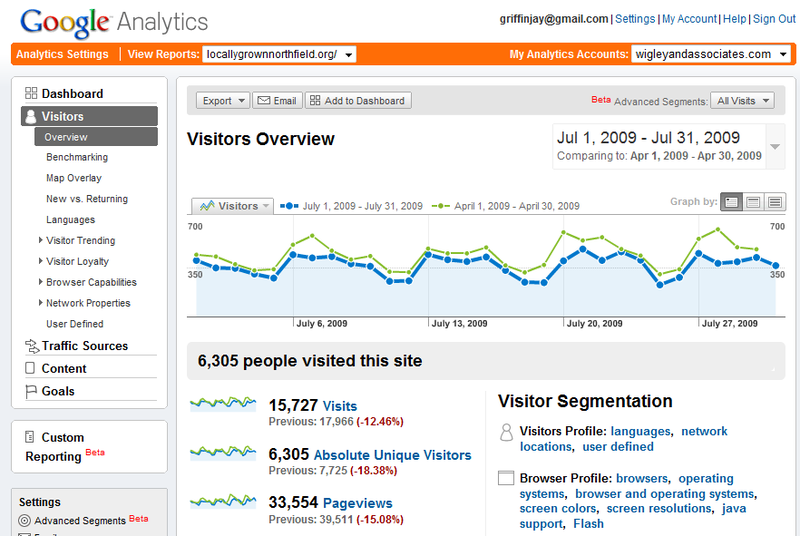 Site visitors set a record, going past 8,000 for the first time; pageviews and visits were down 8-10%. That may be because I’m now able to prevent pageviews and visits by me, Ross, Tracy and Bonnie from adding to the totals. 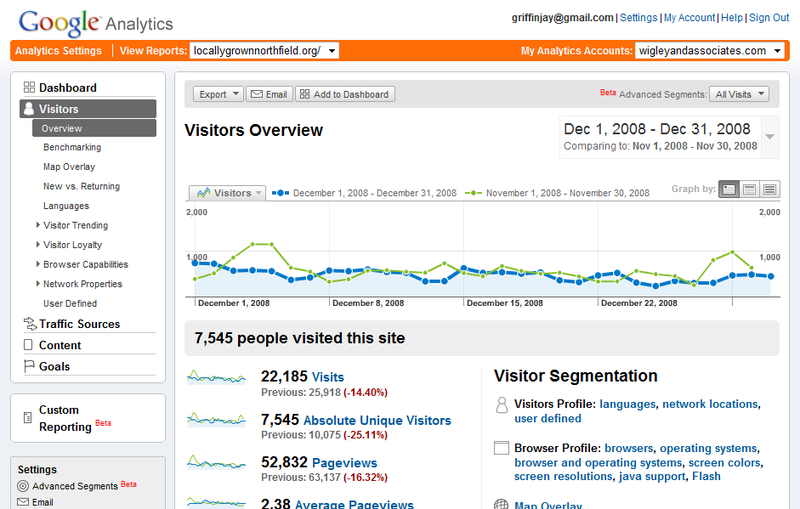 LoGroNo (Locally Grown Northfield) traffic for December declined significantly, according to Google Analytics. Back in early October, I blogged that we had a record September for unique visitors (6,921) and comments (1,211). I was expecting we’d do even better in October because of the elections, but alas, when we unveiled a new look to LoGroNo in mid-Oct, we forgot to put back the Google Analytics code that tracks our traffic, so all of October’s stats were lost. 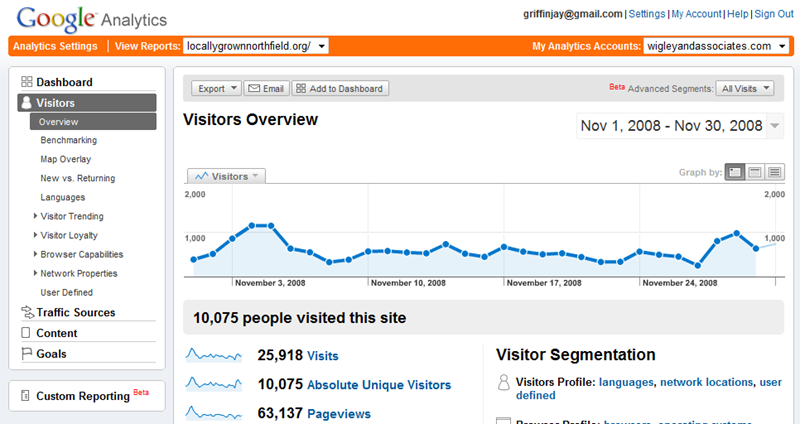 LoGroNo (Locally Grown Northfield) traffic for November was a record-setter for unique visitors, according to Google Analytics. Bonnie Obremski’s RepJ story titled Northfield video game designer immune to economic woes which was visited and pinged often by gaming sites around the world. That was the #1 blog post for November. My blog post titled Stealing lawn signs: an act of civil disobedience or amazing stupidity? The St. Olaf visiting prof made headlines around the world. Participation: Number of people commenting during the month: 117. Number of comments posted during the month: 933. The number of unique visitors was just shy of 7,000 for the month, our highest ever. #1 blog post for September was Presidential election 2008: candidates, campaigns, issues. Participation: Number of people commenting during the month: 107. Previous: 130. Number of comments posted during the month: 1211 (highest ever). Previous: 966. 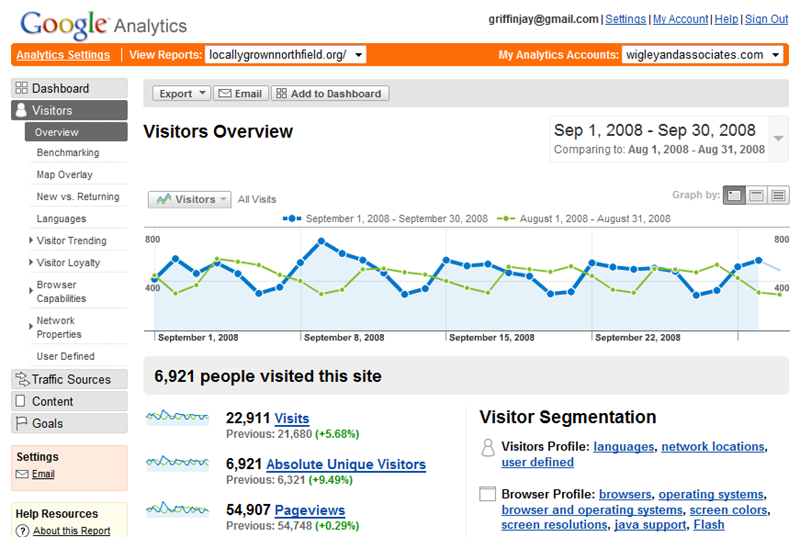 Traffic was 85-95% higher than August of 2007. #1 blog post for August was Were Citizens Mean to Administrator? with 1,680 Pageviews, 1,389 Unique. Participation: Number of people commenting during the month: 130. Previous: 118.